RBTH presents a selection of views from leading Russian media on international events. Today, the status of the truce in southeastern Ukraine, further integration between Russia and South Ossetia and the Russian view on events in Egypt. The Nezavisimaya Gazeta newspaper writes that the truce in southeastern Ukraine has practically been broken and that military activity is increasing day by day. Yesterday, a representative of the Donetsk People’s Republic told the paper that the Ukrainian armed forces have increased shelling in Donetsk. 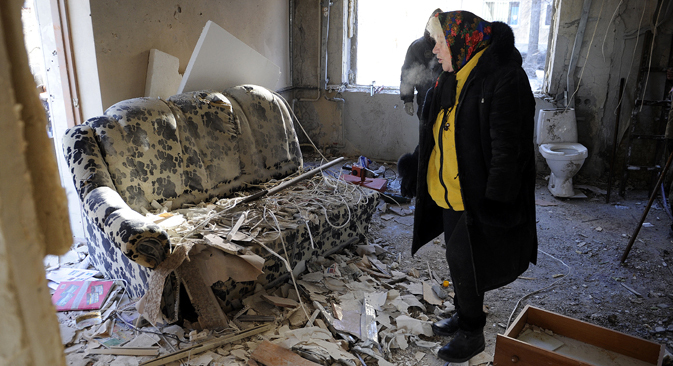 "In just one day we have identified 66 violations of the ceasefire," the representative said. Similar statistics have been presented by the press center of the Ukrainian forces participating in operations in the region. According to the Ukrainian press center, the heaviest fighting is taking place around the Donetsk Airport. Commenting on the situation in southeast Ukraine, Valery Chalyi, deputy head of the presidential administration of Ukraine said: "A new power game is beginning… There are various views, there are hawks, there are doves, there are different thoughts… There are some kinds of uncontrollable units there, there are more controllable ones… I believe that the threat of returning to force has not disappeared." Russian daily Kommersant writes that the governments of the Republic of South Ossetia and Russia have been discussing increased alliance and integration. Yesterday South Ossetia's Political Council approved a document that includes the strengthening of defense ties with Russia. However, the agreement is not universally popular in South Ossetia, which broke away from Georgia during 2008’s Five Day War but remains mostly unrecognized internationally. A representative of the opposition People’s Party said: "This agreement has split society: we all understand that without Russia we have no chance, but when the Interior and Defense Ministries and other structures pass to Russian organs, there can no longer be any talk of independence," said an anonymous source in the South Ossetian Parliament. "Why should we then pretend that we are building an independent government?" Zurab Abazhidze, the special representative of Georgia's Prime Minister on the Regulation of Relations with Russia, told Kommersant that signing such an agreement "will have negative consequences on the region's security, as well as on our attempts to break free from the vicious circle that we've been in since 2008." South Ossetia's Ambassador to Russia Dmitri Medvedev tried to underscore the importance of the agreement. “This will be an agreement between two countries. In various media sources there have been ideas and fantasies that are based on the allegedly 'original' version of the agreement. I wish to appease everyone: there will be no reduction to the sovereignty of the two sides, and Ossetia is not planning to enter any kind of entity." The Vzglyad newspaper writes that an Egyptian court has annulled corruption accusations against former president Hosni Mubarak after previously declaring him innocent in the deaths of demonstrators in Tahrir Square during the 2012 Arab Spring. According to Vzglyad, these decisions have resulted in a return to the political system that existed in Egypt before the Arab Spring. "This is the restoration of the Egypt that was lost after Mubarak's deposition, after, in essence, the Islamic Revolution," wrote Evgeny Satanovsky, the president of the Middle East Institute in an opinion for Vzglyad. Vladimir Isaev, deputy director of the Oriental Institute at the Russian Academy of Sciences added: "What is happening in Egypt is something that had to happen: they are cancelling all the decisions made by the Muslim Brotherhood. Taking into consideration that the current president is a pupil of Mubarak, will he really persecute him? Especially since the amounts lost in corruption activities for a country like Egypt are ridiculous." "Today Egypt is stressing its secular component," Isaev continued. "Looking at the countries where the Muslim Brotherhood was in power, Egypt's current government and its people understand the failures of fundamentalists in power." Read more: Can Europe learn from Russia’s experience with Islam?